Somerset, USA 20 September – Go!Foton corporation, global leader in innovative fiber connectivity solutions, is set to showcase its award-winning line of PEACOC™ high-density fiber management solutions at ECOC 2018, Rome 24-26 September. On display this year will be the newest member of the fiber management family, the PEACOC™ Fiber Distribution Hub (FDH). Extending the impact and reach of the company’s PEACOC™ platform, the FDH has been designed specifically to be utilized beyond central offices and data centers. Incorporating the company’s award-winning and patented spreadable adapter technology, the highly compact yet high-capacity PEACOC FDH also improves technician access to small form factor connectors while providing superior fiber management and routing. By enabling this functional modularity, flexible cable management, and multiple mounting options, the Go!Foton FDH can be customized to meet the needs of any customer and deployment situation. The underlying platform which enables the FDH, PEACOC™, is a revolutionary technology that simplifies the increasingly complex industry of optical connectivity. Award winner in the Lightwave Innovation reviews in 2018, the PEACOC™ is the industry’s first and only solution to allow for tool-less access for up to 144 LC simplex connectors. The high-density PEACOC FDH is available in both a hermetically sealed dome enclosure for underground use or a more traditional pole and wall mounted metallic enclosure. Providing options for either factory pre-stub cables or field fusion splicing of both the feeder and distribution cables, the PEACOC FDH leverages Go!Foton’s existing legacy in the manufacture of passive optical components. 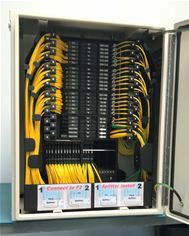 The solution can also be equipped with a wide assortment of PLC optical splitters without sacrificing easy access to both front and rear subscriber connections. The new PEACOC FDH offers exceptional port capacity and density in the smallest possible size, addressing the prevalent challenge of obtaining right-of-way approvals. With support for up to 432 subscribers, no other FDH platform on the market can offer such a high degree of versatility, to support deployment in the ever challenging OSP environment. In addition to its growing portfolio of PEACOC™ fiber management products and solutions, Go!Foton will also display its broad array of passive optical materials and components including its NG-PON2 WM1 & CEx filters, xWDM modules, and PD products. Visitors can find Go!Foton at booth 316 at ECOC 2018 held at the Fiera Roma, Rome, September 24-26.